Hello, my name is Jenna and I am a blush pink-aholic. Pink has always been a favorite color of mine. Elle Woods from Legally Blonde was basically my role model after I saw the movie in high school- both for her pink wardrobe and her sassy attitude. My girlfriends from high school, my sister and I can still pretty much quote the entire movie. Whoever said orange was the new pink, was seriously disturbed… and I mean seriously. I definitely think if Elle Woods was around today, she’d be embracing blush pink as much as I am recently. My favorite way to wear blush is with richer hues (see example 1 here). 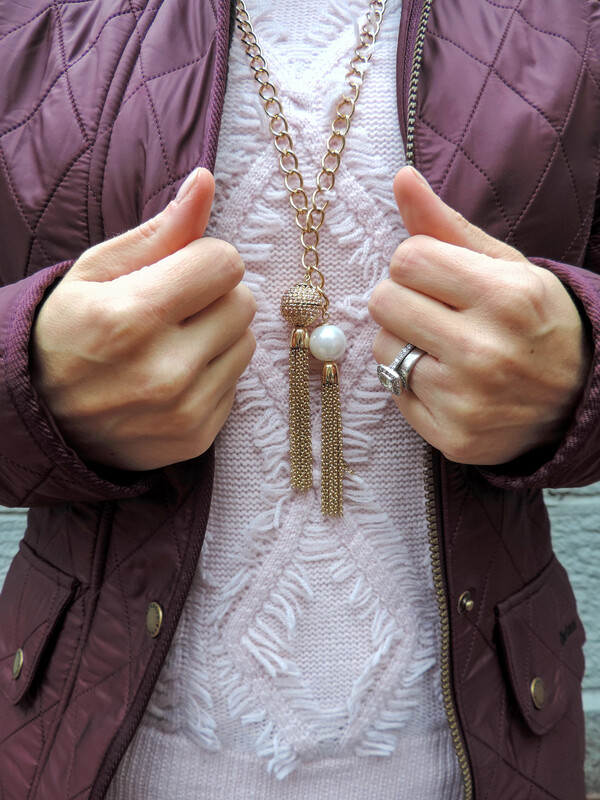 I’m loving the cozy pairing of my bordeaux Barbour jacket with this cable-fringe sweater. My quilted jacket is my first Barbour purchase and it’s been on heavy repeat this fall. It’s lined with fleece, making it a bit warmer than your typical quilted jacket. Bordeaux not your color? It comes in a variety of colors- black, brown, navy, red, olive and pearl- and would make a great holiday gift! Has your style ever been inspired by a movie or TV character? I’d love to hear who! Oh I love the color on your Barbour jacket! Gorgeous!! I just purchased that Barbour jacket in navy! Love it already!! Isn’t it great, Ash!?! Hope you have an amazing Thanksgiving, girl! xoxo! We should start a club. 😉 I adore this look!